The Sign to Keep You from Poking People in the Earhole! The last few weeks have been hard on us. A presidential race filled with shouting and lies and empty of policy discussions tires us all out, doesn't it? How can you get it off your Facebook page? I have the solution! 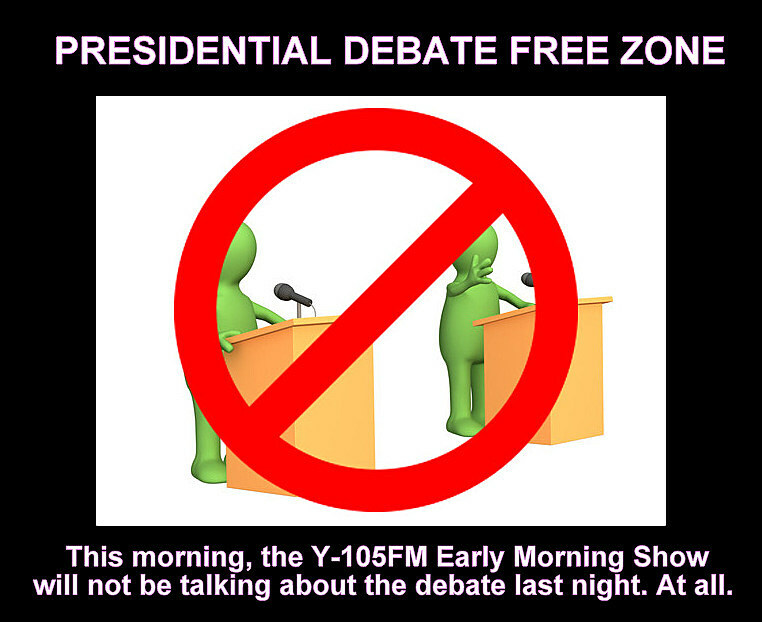 Yesterday, I made the Y-105FM Early Morning Show a Debate Free Zone. Hillary Clinton and Donald Trump went at it Sunday night and Facebook was full of the debate, and each side saying their candidate won, and shouting about this or that. So, I figured we needed an oasis. It was a fun morning, and I'm pretty sure we had a bigger audience because so many are just sick and tired of the blah blah blah. Plus, I found out how to get some free coffee after being tricked into buying flavored coffee! Arrrrgh! Anyway, the No Debate Zone worked so well, I thought, "Hey, let's do the same for politics! At least until November. The sign above is yours...you can right click on it and "save as" and boom, it's yours!